After the last match where I did okay and actually managed a few fish on corn, I was a little more confident going into this one (which is bound to mean the kiss of death!). Before I get on to this weeks match, the club would like to say a massive thanks to Hurf, Jake, Rob, Frank and Max for doing some swim clearing during the week, well done guys! As per usual we met at Ilminster Bowling Club for brekkie and there were a few sore heads as Rob, Hurf, Frank and Jake (who never made it to the draw!) had been out celebrating Leighton and Kayleigh getting hitched the day before, congratulations to the happy couple and all the best for the future. Hurf announced the draw and I went into the bucket of dreams with only two balls left and pulled out peg 24, one of the infamous bush pegs. 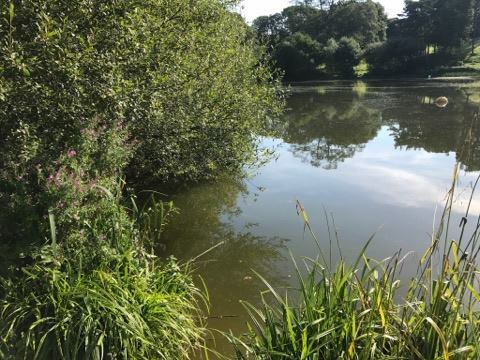 To be honest I had mixed feelings as you feel obliged to fish for the chub and bream that live under the bush and of course they don’t always show. 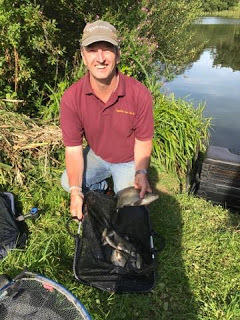 John Dursley did win off it a few weeks back with a brilliant 45lb but other than that, peg 1 has been the better peg, winning four of the seven matches so far. I got my kit to the peg and it looked nice although there was an overhanging branch which meant I couldn’t fish to the point of the bush but I still fancied it. I set up a 1 gram Drennan Tipo to fish at 11.5 metres in open water and a little Carpa 1 to fish by the bush, I had nearly two pints of casters, some maggots, two tins of corn and I also mixed up some Bait-Tech Pro Natural Dark for the long line. 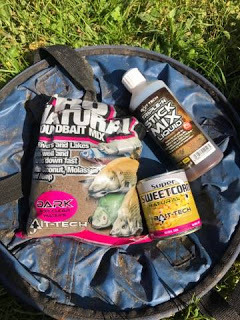 I’ve been playing around with Bait-Tech’s Triple-N Stick Mix Liquid and added several squirts to the water for mixing the groundbait, it’s got a lovely nutty smell and I can think of loads of other uses for it too, I’ll do a proper review soon. On the whistle I cupped in two balls of groundbait at 11.5 metres and then put two big pots of casters and corn by the bush before starting in open water with single maggot on the hook. I had a small roach so switched to caster and had a couple of better roach and then tried a grain of corn, I had to wait ages for a bite which resulted in a 2oz roach and with thirty minutes gone, I was itching to have a go by the bush where hopefully the chub and bream would be lined up! I gave it half an hour with no bites but wasn’t too worried at this early stage, I put in another big pot of corn and casters and went back out on the longer line. 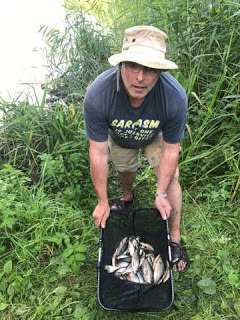 I asked Steve P on peg 1 how he was doing and he said he’d only had a couple of small fish, I hadn’t seen Bill catch yet on 20 although I was sure Fieldy would be catching lots of bits on peg 2. I had another roach on caster and tried corn again, the rig settled and then sunk from view, I struck and it felt like a slightly better fish before I netted a 6oz chublet. The next bite saw more elastic come out and this time it was a decent skimmer around the pound mark and although I wasn’t bagging, I was doing okay from what I could see. With an hour and a half gone, I cupped in another big ball of groundbait containing corn and caster on the long line and went back into the lions den. Another thirty minutes passed without any indications and although I wasn’t panicking yet, small elements of doubt were starting to creep in. It was a bright and sunny day, not ideal conditions for bream and I was beginning to think it might be quite a low weight affair today. 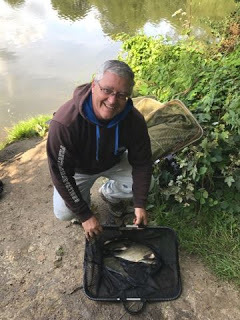 I could see Rob on 19 and John Dursley on 18 were both swapping between pole and feeder which usually means people are struggling, Bill still hadn’t caught and if Steve P was telling the truth, he only had around a pound of bits, surely somebody would find a few bream (hopefully me!). 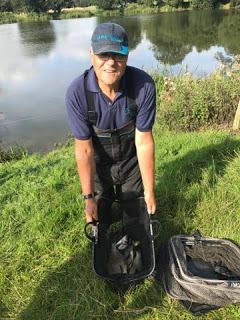 I put in another big pot of grub by the bush before going back out and I had a second chublet quite quickly and then after a long wait I missed a good bite but on the next chuck I had another slightly smaller skimmer, this one around 12oz. No more bites so back by the bush and still nothing as we passed the half way mark, any thoughts of bagging had long gone and I was just hoping to get a couple of bites under the bush from bigger fish. I’d been feeding casters on the long line and there were some swirls from better fish and I couldn’t resist having a go for them so quickly set up a shallow rig and had a couple of slightly better roach but they soon disappeared when I put the pole over their heads. Then Bill had his first skimmer and then added two more in quick succession followed by a proper bream so I chucked the shallow rig up the bank and went back by the bush, I needed a couple of lumps now and was hoping they might get their heads down in the last hour. I tried going further and further under the bush but just couldn’t get a bite, I tried double caster and finally the float sailed away but I missed it and then missed the next one too! Then it was third time lucky but a one ounce roach wasn’t going to help my cause much! Jake turned up for a walk round and said nobody was bagging and that Frank was doing well catching roach shallow on peg 16 and that’s what I should have done but it was pointless doing anything else now and I was committed (or should be committed!) to trying to catch a couple of chub. With five minutes to go, the float finally flew away but I struck and hit a branch and that was it, my final tally was 13 fish (two skimmers, two chublets and nine roach) and once again I’d got it all wrong. I packed up and took my gear back to the car before catching up with the scales, I missed Nick Payne who’d done well again to weigh 8lb 15oz of skimmers from peg 14, then Frank had a nice bag of roach weighing 9lb 4oz and he’d only fished for them for three hours, Bob didn’t weigh on peg 17 and then John Dursley had four skimmers for 4lb 5oz from 18 and Rob had chucked back on 19. 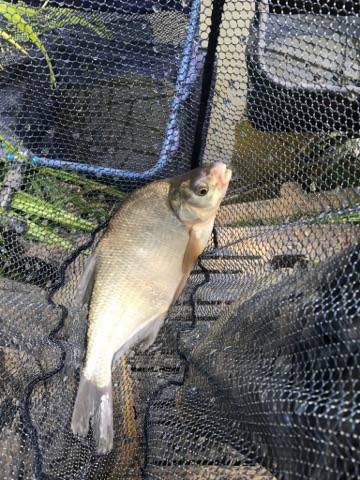 Then we got to Bill who had a good bream and eight skimmers for 14lb and unless there were any surprises, he would win with that, my fish went 4lb 1oz and I only weighed in for the sake of the side bets! Back at the results and Adie Bishop had the top weight in the other section with 10lb 14oz from peg 7, Fieldy had 10lb 7oz from peg 2, Rich Studley had 4lb 8oz, Justin had 4lb 6oz and then Hurf had 3lb 4oz and Steve P had 1lb 3oz so at least I’d won the side bets (or I would have done but Steve P sloped off and Hurf didn’t have any change!). Even though the pond fished quite hard with the lowest winning weight of the series so far, it’s really intriguing fishing and I feel like I got it badly wrong again. If I could fish the match again I would fish for roach and I’m sure I could have framed but that’s with the benefit of my old friend hindsight. It’ll be interesting to see if the weights are back to what we’re used to or if this match was a blip, peg 24 will probably win with 100lb next match now! !